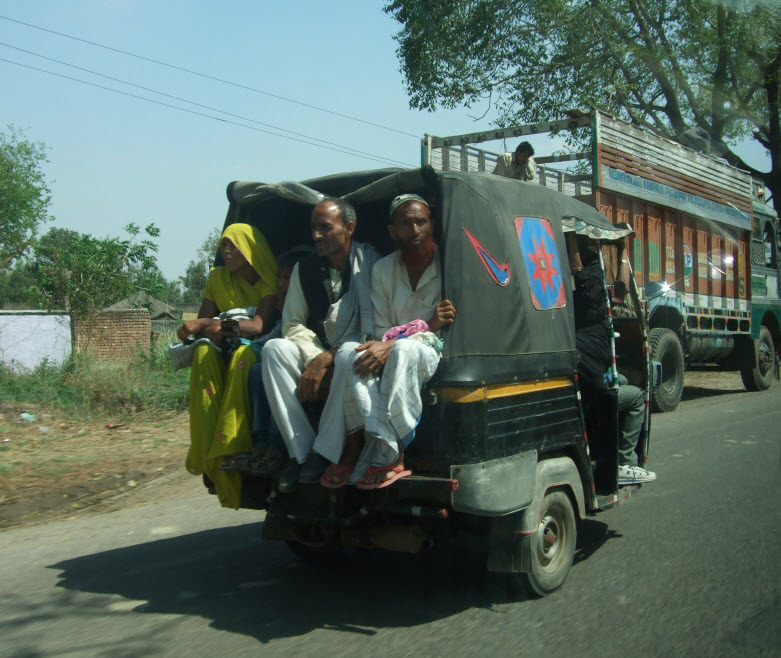 Traffic in North India is not very different from traffic in the South. But there were subtle differences. 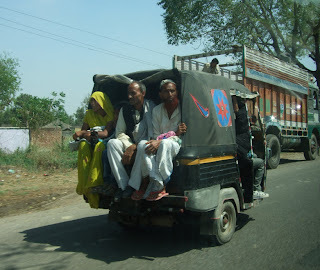 I had already mentioned about two accidents, one on the day we were driving to Hansi, Haryana from Delhi and the other in Hansi. The first involved the Toyota Innova we were travelling. On one of the Highways just outside of Delhi a traffic cop stopped us. As the driver was slowing down I knew he had something on his mind. As the cop was being mislead that the vehicle was going to stop the driver suddenly stepped on the pedal and sped away. The cop was just able to tap the vehicle with his lathi. I was wondering if there was a chase ensuing. A short while later the same vehilce scraped against a small pick-up truck. The sound was so loud I thought damage was done. Fortunately there was only a small scratch but the rear bumper on the left side seemed disconnected from the body. The left rear-view mirror though knocked and folded-closed from the impact also only had a minor scratch. However the best part was that the driver of our car didn't even step outside to inspect the damage. He continued to drive on. On enquiry I found that the Innova we were driving was also his. Strange and unbelievable. The other accident took place in Hansi when a two wheeler hit ours and as if nothing happened the two parties just went about their ways. I was dumbfounded. I have been in accidents in Chennai and I know the aftermaths of such events. Share autos are interesting. They have an additional seat at the rear for rear-facing passengers. Certainly not safe and for those who have problems when seated in moving vehicles going in the opposite direction they are facing. I know one friend who just cannot sit that way. One sad observation is that cycle richshaws are very much in vogue up North with more of them being used near train and bus stations. In Chennai they are almost extinct and their usage in Delhi and Haryana seemed odd and a little disturbing too. I am happy I didn't see any hand-drawn ones. I believe they contunue to be used in Calcutta. P.S - On the way to Hisar I saw two white limousines parked in an open area. I believe marriages these days use them.